This is from a Project Day, 3/16/14. There’s an eclectic mix of things going on during these meetings. 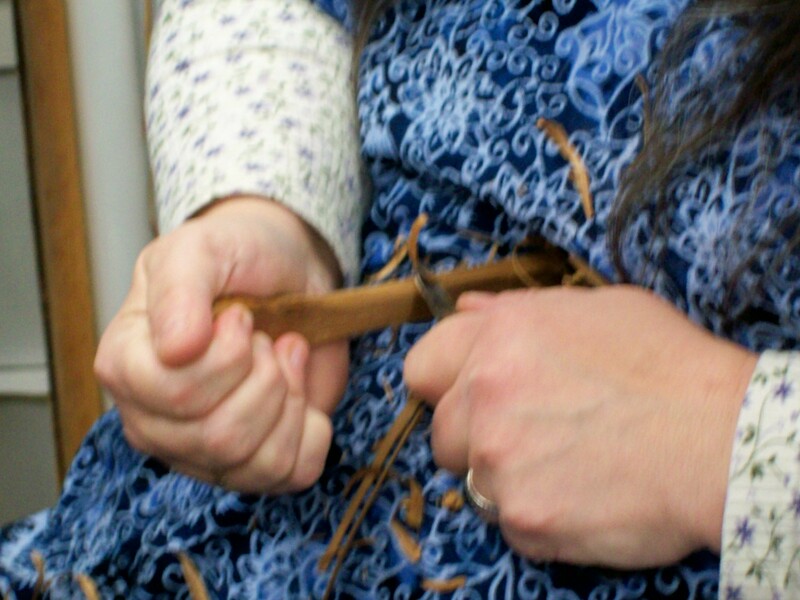 On this particular day, along with the spoons, was some soapstone carving, sanding/finishing on several inkle looms and a pincushion with a Holbein embroidery top. I’m not going to claim that these spoons are anything awesome. They’re a first attempt after all! 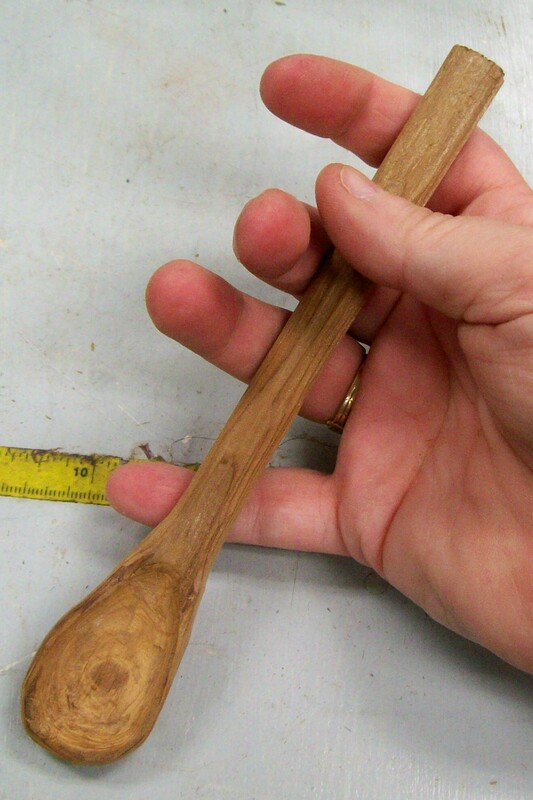 I wanted to make something useable and useful, more than something artistic, but the stick had an interesting knot in it that I thought would look cool as the bowl of a spoon. Then I pulled out boxes of heirloom carving tools and started in. Yes, heirloom. My grandfather and his brothers had made and used a lot of carving tools. 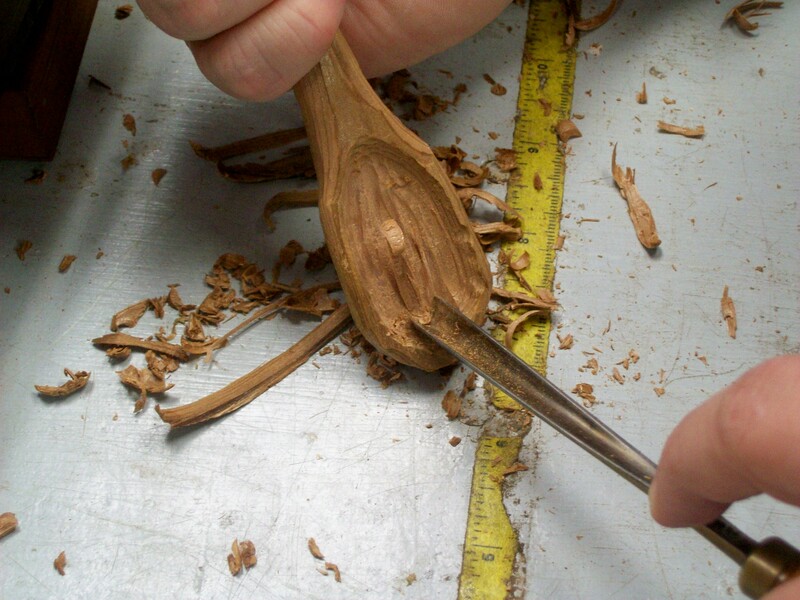 When I was small I would sit on the floor and play while the shavings accumulated around me and the beer level in their mugs would go down while they made small pieces, among them many spoons, so I was familiar with the process. 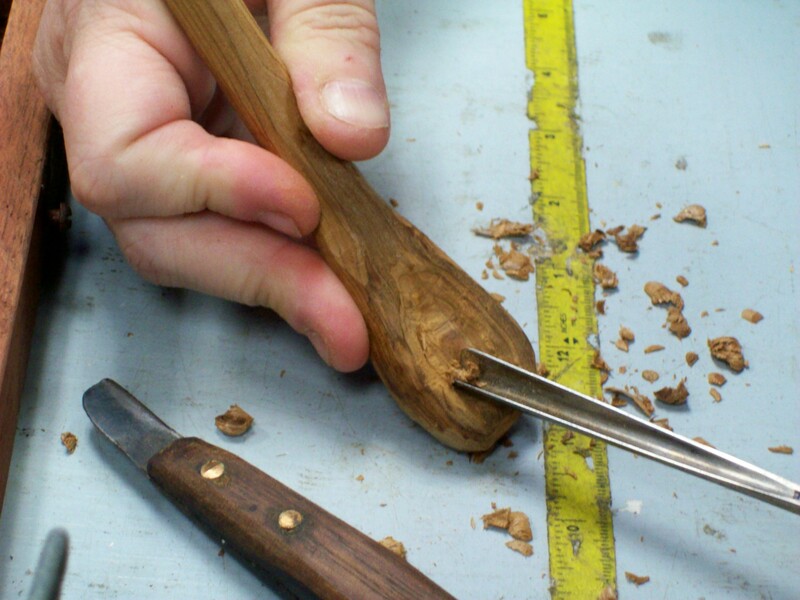 My father also carved and the gouges that you can see in some of the pictures are his. 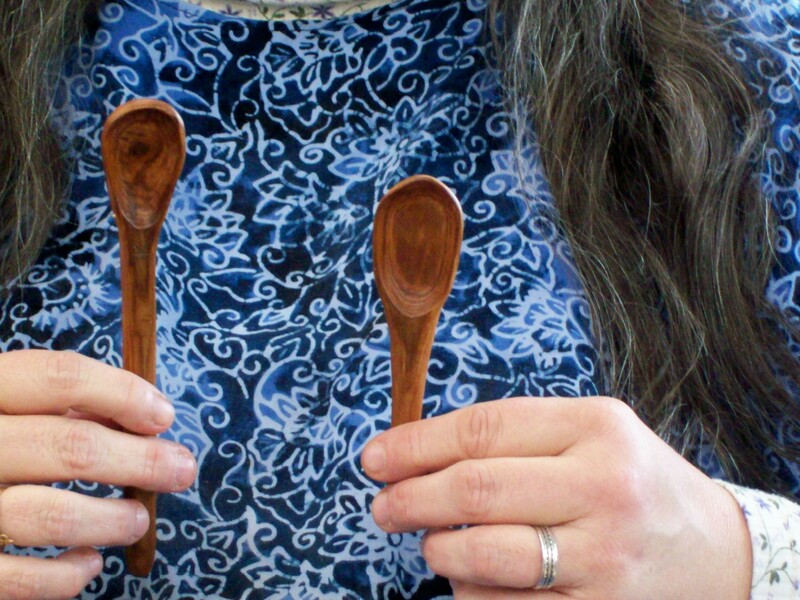 I used a knife to quickly whittle down the handles and then to rough out the shape of the back of the spoon bowl. 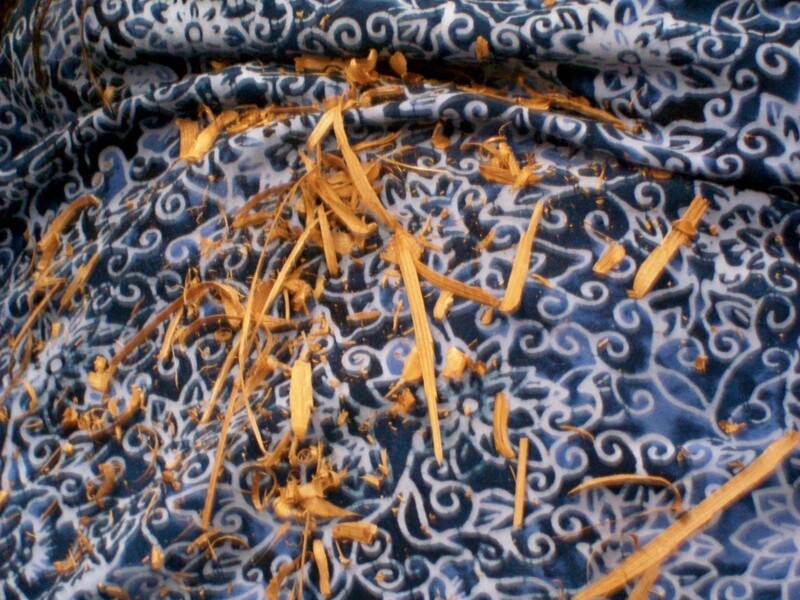 I had some trouble because the wood was a little splintery and I took off more than I meant to several times! 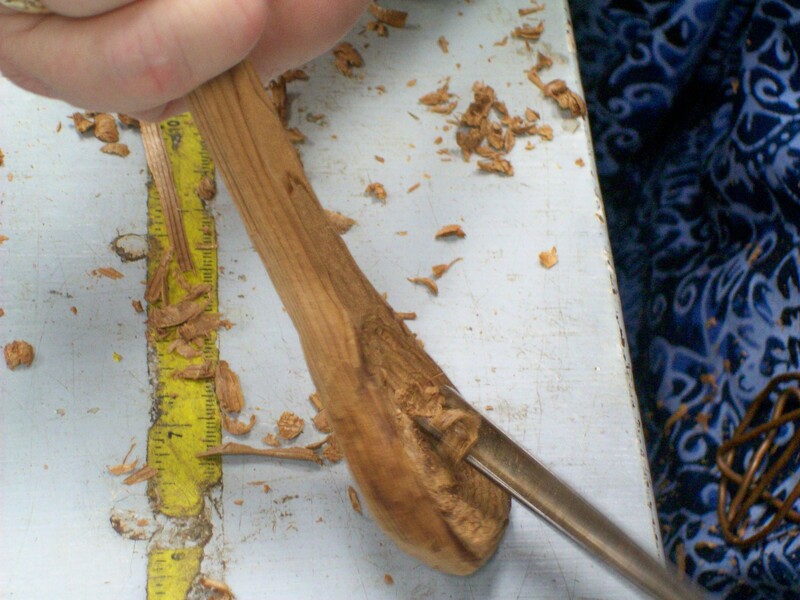 This is one of Daddy’s gouges in action as I was hollowing out the bowl. 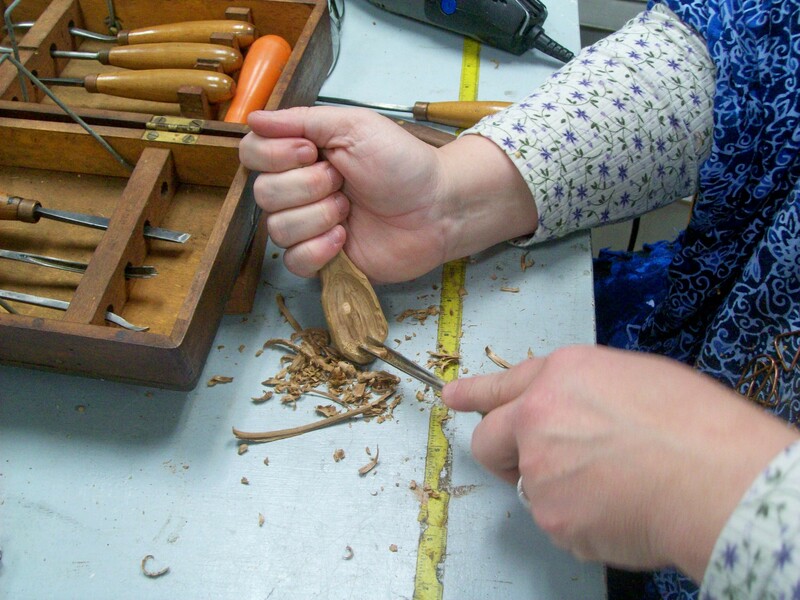 And a picture where you can see more of the tools and I kept going, working on the bowl. The knife is right behind my wrist. I wish I had a better picture of it…..
There’s also a dremel tool at the top of the picture that I used towards the end of the day to finish smoothing things out. Btw, you can click on these pictures to see a larger version. I used the smaller ones so that the process would be more visible, but at the cost of detail….. Here, it’s almost completely roughed out. It actually looks like a spoon! …and a side view. It doesn’t bend the way modern spoons do…. …and then I thought of something else. The little mark at the base of the bowl is called a “gromky znak”, which translates (badly) as “thunder mark”. It’s a symbol of the god, Perun, that my family, although nominally Catholic, had a special devotion to. I’m pretty bad with the tools, yet, and little bits flew off, messing up the design, but this is close. Now, I’m going to switch to the other spoon…. 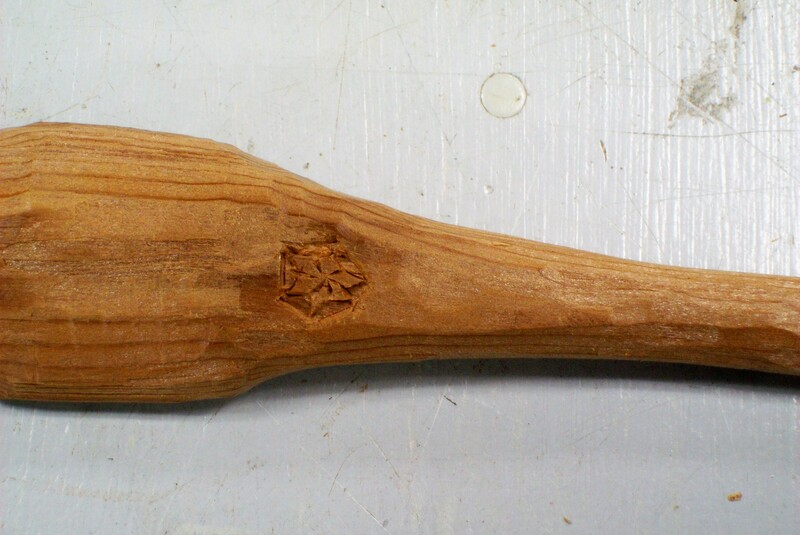 First, roughing the handle. Sorry about the “blurry”. I was moving when Marcus took the shot. Yes, this is what I looked like afterwards…. Absolutely covered with the stuff! 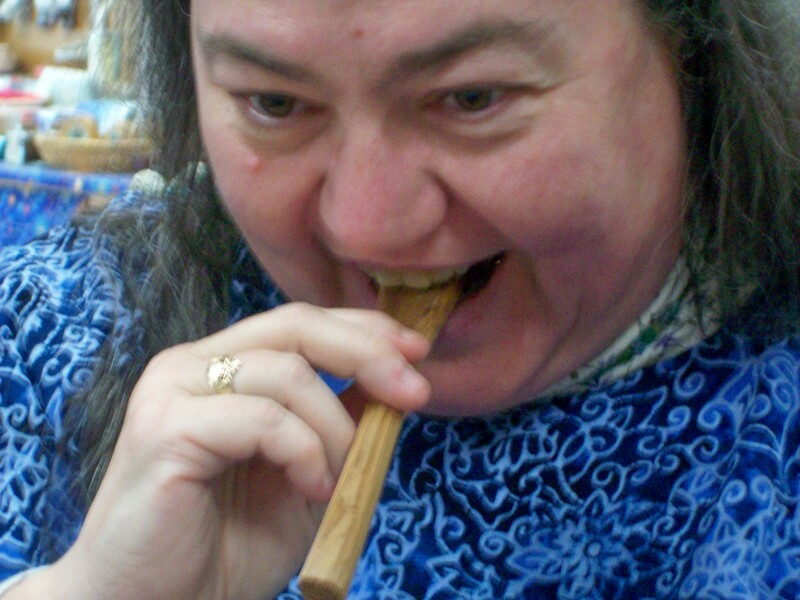 Checking for fit in the mouth…. Starting the bowl. 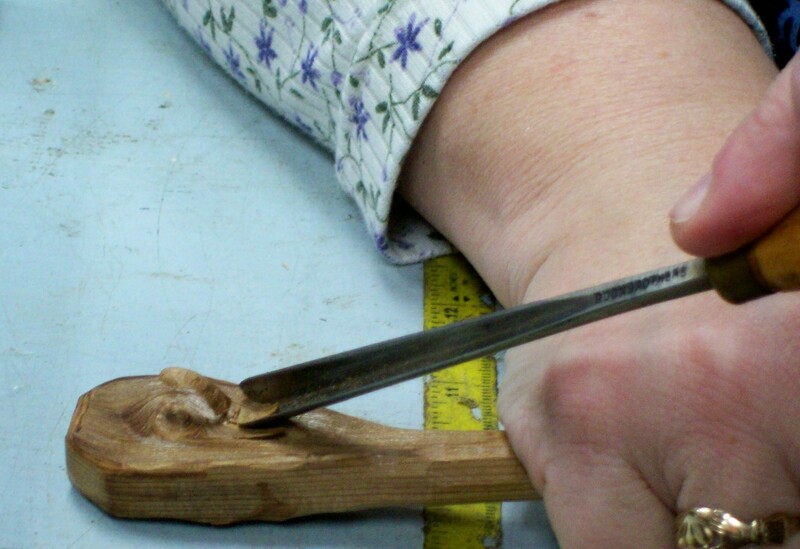 I was working around an interesting knot that I wanted to preserve for decorative value, and I was very concerned that I might break it out of the wood. I had to be careful. Wrong way to hold the tool…. I was putting pressure downward, or I never would have done this! 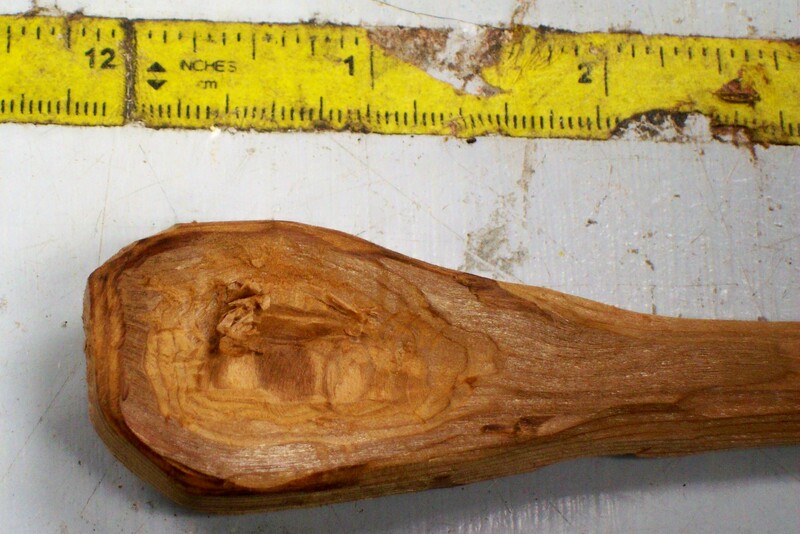 The knife below is the one I was carving with. Handmade! Close up so you can see the knot. Still working on the bowl….. Carving is pretty well finished, here. 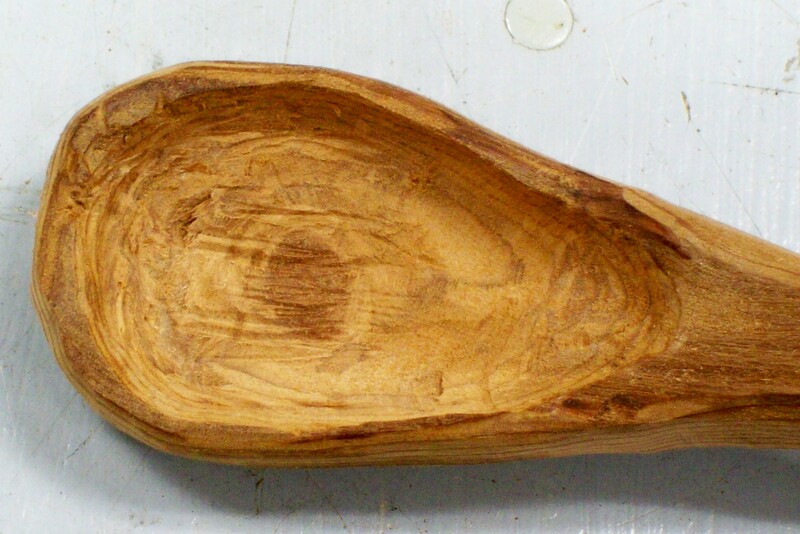 A close – up of the bowl before it got hit with sandpaper and a dremel tool. Close-up of the other gromky snak, this one a lot simpler…. 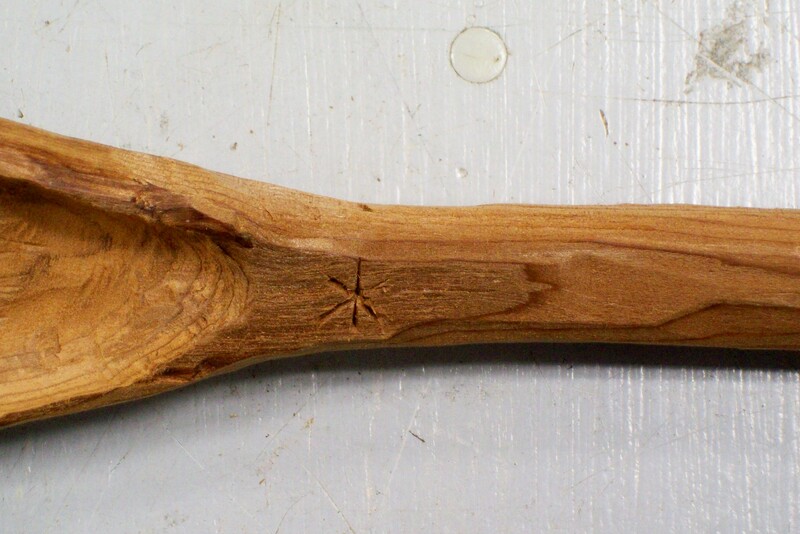 Front side of both spoons before sanding. You can see that the ends are shaped, now. Front side after sanding/…big difference on the inside of the bowls! Now, the last step – finishing! 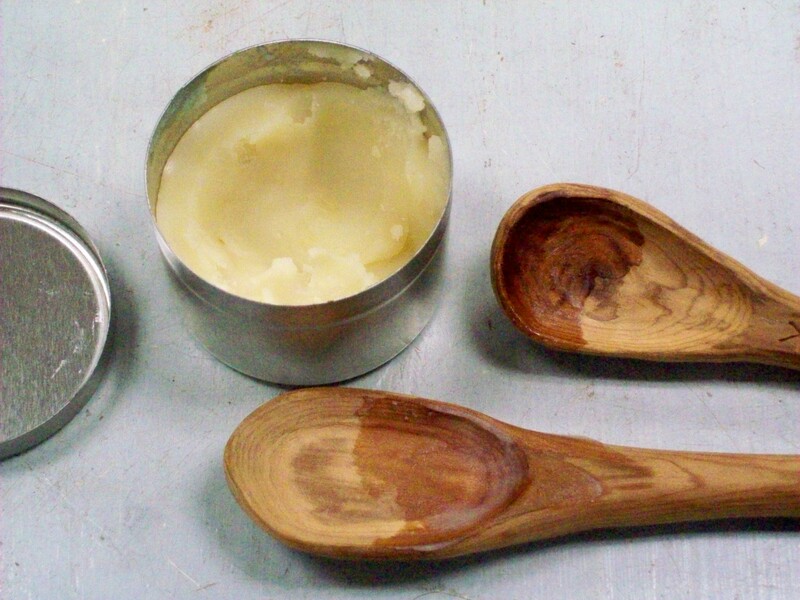 The stuff in the tin is “wood butter”, a mix of beeswax, edible oils and rosemary that I do up for the shop. 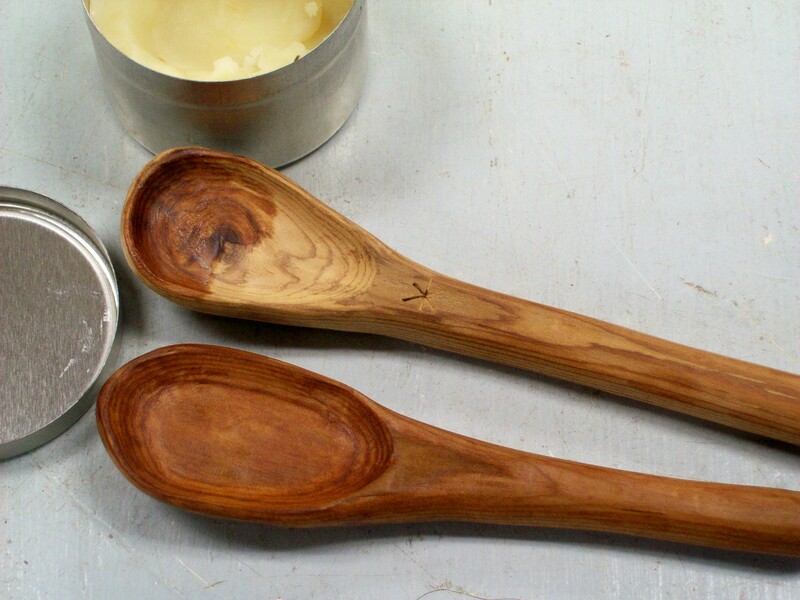 It’s great on wooden dishes, so I used it as a finish on the spoons. You can see the difference just patting it on made, let alone rubbing it in! Done! 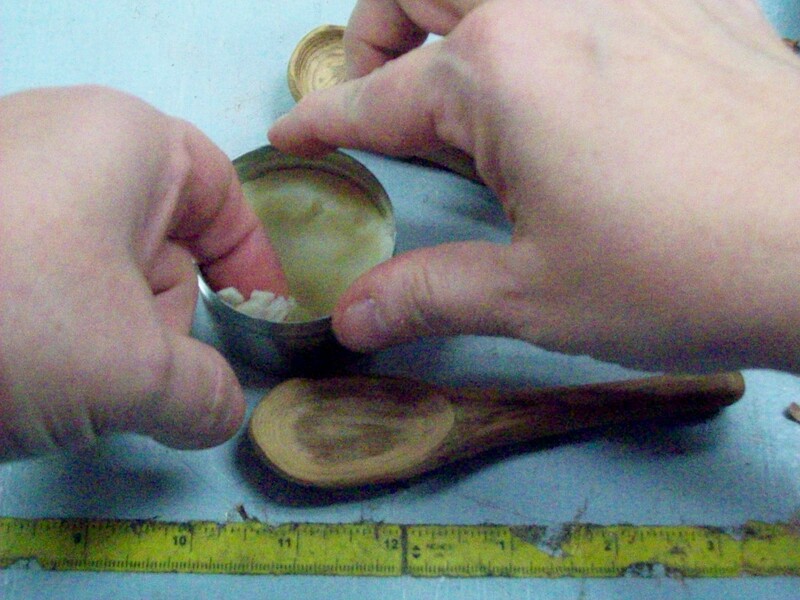 …although they took another coat of the wood butter about a week later, as I was putting them away with the rest of the feast gear. 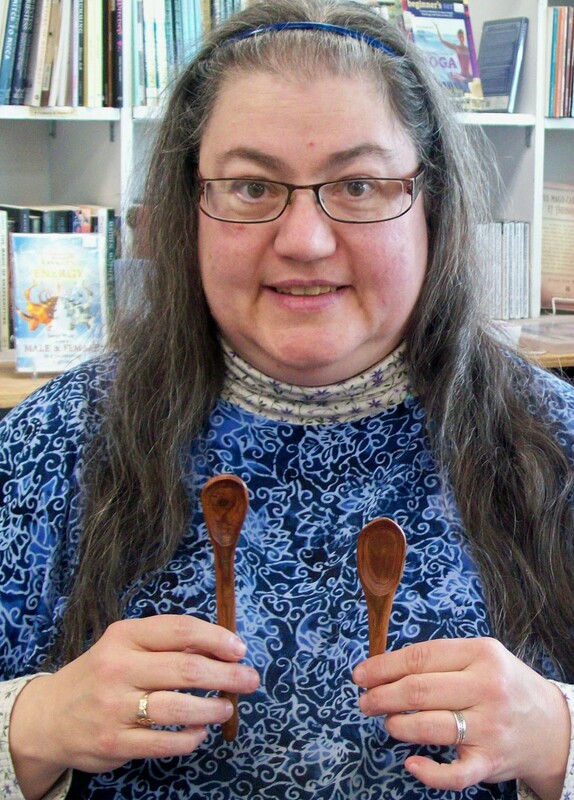 One last pic of me being proud of having finished a couple of spoons! A Gallery of spoons and forks!